On Thursday, August 8, IMMI, the manufacturer of SafeGuard seats hosted “SafeGuard: School Bus Safety 101.” Indiana Congresswoman Susan Brooks, school officials, federal safety representatives, parents, and law enforcement leaders were presented with the facts and misinformation surrounding school buses and lap-shoulder belts. They all witnessed a live crash demonstration of a school bus into our CAPE facility‘s barrier wall. The result? A realization that there are No More Excuses. 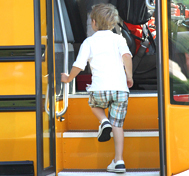 School buses remain the safest form of transportation, but let’s make them safer. Lap-shoulder belts reduce injuries, reduce driver distraction, and improve bad behavior on school buses. In addition to this article, please refer to this infographic that will help provide the additional information you may be seeking. If you would like to revisit other topics covered during this event, we live-tweeted on Twitter using the #BusSafety101 hashtag, so feel free to read through and catch up on what happened. Seems like common sense to want seat belts on school buses, right? What’s stopping the safety trend? There are several forms of misinformation out there that we are dispelling. MYTH #1. Compartmentalization (higher seat backs and extra seat padding) is enough to protect students in school buses. “School buses are the safest form of transportation with many government manufacturing standards,” IMMI Vice President James Johnson assured the guests. “But the current standards do not adequately protect students in the event of a side roll or a rollover crash event.” Compartmentalization, in other words, does well when the school bus is in a frontal or a rear crash, but it has some huge safety weaknesses. How glaring is the safety issue of a side roll/rollover crash in a school bus without seat belts? Here are two videos to demonstrate the need for lap-shoulder seat belts to prevent serious injuries in these events. Fact #1: Compartmentalization, while effective, is not enough protection for students on school buses. 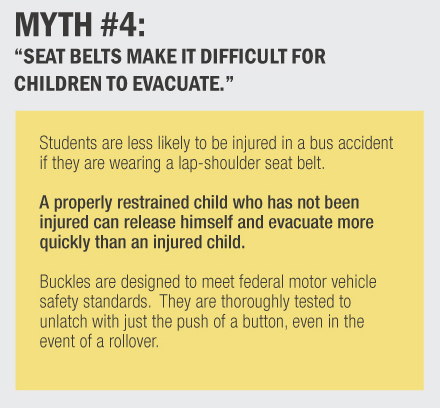 MYTH #2: Seat belts on school buses slow down evacuations. This simply isn’t true. With over 200,000 of our SafeGuard seats in use today, we surveyed and interviewed students, bus drivers, transportation directors and board members. Drivers told us that even during an accident on their bus, it wasn’t the seat belts that slowed students down — it was the bottleneck that occurred at the exit points (the rear door, front door, and window exits). FACT #2: Seat belts HELP evacuations. An uninjured child can evacuate more quickly than an injured, or unconscious child. 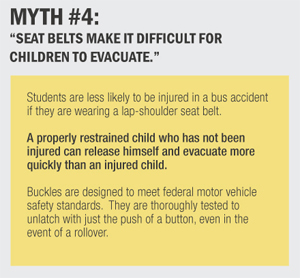 MYTH #3: Seat belts can be used as weapons on the school bus. While this may have been true with the older-style lap belts, our SafeGuard lap-shoulder belts are RETRACTABLE. The seat belt webbing (strap) retracts into the seat back, as they do in your car. The buckles are lightweight, making them virtually impossible to be used as weapons. Seat belts as weapons? It’s just not true anymore. In fact, our customers have reported that the behavior on their school buses equipped with SafeGuard lap-shoulder belts (and an enforced usage policy) has drastically improved. When students are required to stay seated and facing forward, it makes for a better behaved bus, less reported incidents of bullying, and increased safety. FACT #3: Seat belts actually improve behavior in the school bus, and they CANNOT be used as weapons. See for yourself. Check out this video in which bus drivers, transportation directors, and school officials describe their experiences with SafeGuard lap-shoulder belts.